Dr Blood's Video Vault: Yet another new horror blog - The Horror Cats! Yet another new horror blog - The Horror Cats! I've just started another blog called "The Horror Cats". Yeah, it's all about cats in horror films. I'm going to add something to it every time I see a horror film with a cat in it. Since I've only just starting rewriting the reviews for the films beginning with "A" in my Video Vault, this may take some time. 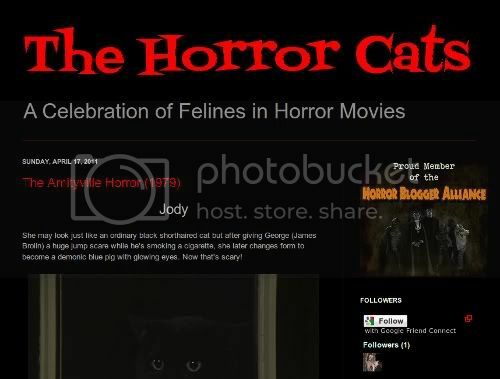 Anyway, if you like cats and feel like adding another blog to your reading lists, either click the screencap above or this link: http://horrorcats.blogspot.com and become a follower. Just in case you wondered, yes, I was getting bored with writing reviews of all the horror films that I've already seen. This is just a bit of extra silliness which I'm using to help me to concentrate even more on the films that I'm rewatching.